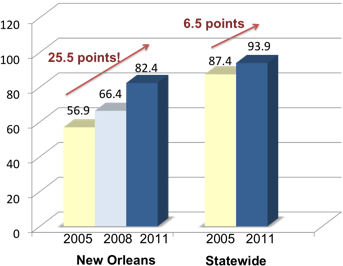 2011 Scores are In — New Orleans is #1 in Growth! | Educate Now! To put this growth in perspective, it is roughly the equivalent of an average increase of 2 ACT points for New Orleans students – huge growth! During this same time, the state grew 6.5 points or 7.4 %. Our estimated DPS places New Orleans in 1st place for growth since 2005. The #2 spot goes to Red River Parish with a DPS increase of 24.6 points. Even if Educate Now! is off by a few tenths of a percent, New Orleans remains #1 in growth! The district performance score is the most comprehensive measurement of performance. It includes all students, all tests, all performance levels, as well as dropout and attendance data. Educate Now! calls on the Department of Education to release the official 2011 combined score as soon as possible. RSD’s DPS score went from 41.8 in 2007, to 60.6 in 2010, to 69.2 in 2011. OPSB’s 2011 score of 118 is the second highest DPS in Louisiana. RSD ranks #1 for growth between 2007 and 2011; OPSB ranks #4. The number of schools performing below 65 (F) continues to fall. In 2005, 110 schools received an SPS – 78 were below 65. In 2010, 68 schools received an SPS – 24 were below 65. In 2011, 75 schools received an SPS – 21 are below 65. The number of schools with an SPS of 90 or higher (A, B or C) continues to increase. In 2005, 14 out of 110 schools had an SPS of 90 or higher. In 2011, 25 out of 75 schools had an SPS of 90 or higher. Almost every school is improving. 23% grew by at least 20 points! Download a complete List of School Performance Scores for New Orleans (xls), sorted by district, with letter the grades assigned to each school. In 2010, the Board of Elementary and Secondary Education (BESE) approved a new grading system for schools. Instead of a 1 to 5 star rating, schools now earn letter grades based on their annual School Performance Scores (SPS). Schools that meet their growth target earn a plus (+) sign after their letter grade. If a school declines from 2010 to 2011, the letter grade is followed by a minus (-) sign. To compare school performance over time, Educate Now! converted the SPS for New Orleans schools in 2005 and 2010 to letter grades based upon the 2011 grading scale. Most of the high schools that opened in 2006 saw very big jumps in their SPS, due in part to a new element that’s been added to their SPS calculation: the Graduation Index. The Graduation Index assigns points to a school based upon how well the high school did in graduating their students and how well prepared these students are for post-secondary education. For more information, see Understanding the New Graduation Index. The following high schools were open in 2006-07, and their 2011 scores now include a Graduation Index. Educate Now! congratulates these high performing schools that received a school grade of either an A or a B. Our challenge for the future will be to continue to improve our school performance – and to improve faster than the rest of the state. While we celebrate growth – and we should – at the end of the day, what students and their families care about is are students getting the education they need to be college and career ready? Right now, the answer for too many is still “no.” We are doing a much better job, but we have a long distance to travel. We have had 5 years of sustained, compounded growth. Here’s to hoping for a 6peat this school year. Congrats to the principals, teachers, charter board members, school support staff and others who work every day to improve their schools and the educational opportunities for our children. As a city, y’all did a great job in 2010-11! Thank you. View the Department of Education’s press release.